Resident Evil 4, as franchise fans will know, was a true revolution. Its dramatic changes to the series’ DNA weren’t universally popular (a euphemism for still cause many to go on spittle-flying Internet tirades to this day), but they were certainly radical. They also begged the question: can survival horror really work in this pseudo-TPS, actiontastic style? When you’ve got more ridiculous weaponry than Arnold Schwarzenegger, what do you have to fear? Well, if you’re going to be pernickety, that’s two questions. Fortunately, though, here comes Dead Space to help us answer both of them. 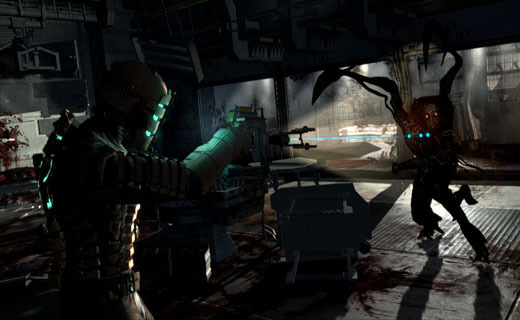 The game was released in 2008, and followed a similar horror/shooter template. It’s set five hundred years in the future, and humanity have predictably advanced from screwing up their own planet to screwing up everybody else’s. Our resource-ravaging ways have taken the ultimate step with the creation of the planetcrackers. These are vast starships with the capacity to ‘drain’ orbiting planets of everything of use, which sounds just about right really. This dystopian image of the future was the first thing I found ‘scary’ about Dead Space, a possibility that hit just a little too close to home. I was unnerved even before the throat-slashing death beasts OF DEATH made an appearance. Our protagonist is one Isaac Clarke, part of a mining team sent to answer a distress call from the Planetcracker Ishimura. Whereupon, naturally, all hell breaks loose, and his companions are slaughtered in a blood-leaky manner by the Necromorphs that have infested the ship. Where the hell did this guy come from? Much like Resident Evil 4‘s Ganados, these hideous buggers are a step above the shuffling, useless zombies of survival horror yore. Necromorphs are born from the insidious influence of the Marker, a mysterious alien artifact. It first drives those within its proximity insane, eventually driving them to murder. Then, it spreads a virus that corrupts the bodies of its victims and mutates them into these beasts. Ghastly as it all is, another little innovation was added to the combat. The resilient Necromorphs have to be killed by a technique known as ‘strategic dismemberment,’ meaning that you must slice away their limbs to destroy them. Mmm, yummy. On top of that, Isaac is an engineer, not a badass supersoldier with rippling pecs and so on. As such, he’s mostly armed with improvised weaponry, a rock-boring handheld laser for instance. This lends an oddly ‘vicious’ edge to encounters which isn’t always found in games. Another thing Dead Space does very well is maintain that oppressive atmosphere. As TPS-y and bullets-flying-every-damn-where-y as it is, that’s tempered by a psychological aspect. Some genuinely creepy moments ensue with survivors of the incident (none of whom survive for long), in inaccesible areas you can only watch from. 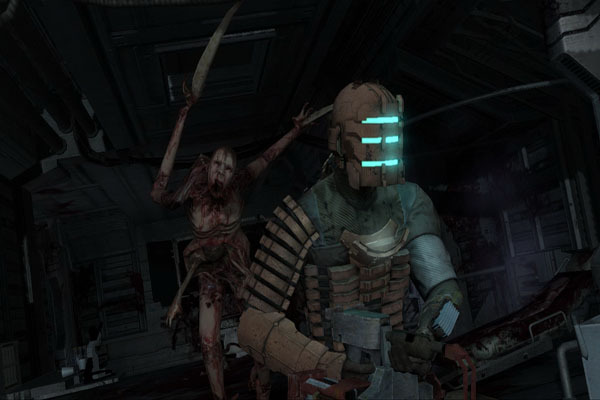 Dead Space, I think, combines the immediate jump scares with a deeper sense of lingering dread, and it’s very effective. The developers aren’t named Visceral Games for nothing.